I share the grief and sorrow expressed by my erstwhile colleagues in the MAG. Haiyan was always very supportive of our work and she will be missed. My condolences to her family. It’s shocking and sad to know that our beloved Ms. Qian has passed away. Please convey my deepest condolence to her family. I missed her. I was deeply saddened to hear about the news. I met first Ms. Haiyan Qian in China for our UNPAN meeting almost 8+ years ago. She was such a lovely, kind, active and vibrant person. I recall a time when we had a long day meeting with great exchanges and discussions and all because of her efforts and understanding. One of the nights, she planned a talent show that for everyone included singing, dancing, and entertainment. She was such an energetic and spirited personality. While I only had the pleasure of seeing her 3 times, her memory will always be with me. Please accept my heartfelt sympathy at this tragic time. I hope the passage of time will help ease your sadness and leave you with happy memories. I share the same feeling of sadness with all of you at this moment. The relationship she had with all stakeholders group was a probe of her commitment with the Multistahkeholder principles and and example of how to deal with the challenges of this diverse environment. Beyond her involvement in Internet Governance matters, as Anriette said, she was an incredible woman. We will miss her. I will always remember frist moment I met Ms. Haiyan Qian. Smiling, full of energy, optimistic. With strong enthusiasm she was able to push my work further than expected or I could ever imagine. Will miss her. I recall many good conversations with Ms. Qian, and it’s with great sadness to hear of her passing. She was a very accomplished lady, and she shall be missed. My deepest condolences to her relatives, friends and colleagues. Haiyan was a wonderful boss. Her enthusiasm was contagious; her spirit (through thick & thin) was inspiring. I will always treasure the moments under Haiyan’s leadership. Her fight against cancer was heroic. Prayers of peace for her family. This is a very sad announcement and I express my heartfelt condoleances to all the staff members and Ms. Qian’s family. May her soul rest in peace. I shall keep her devotion and her kindness in best memories. I shall miss her a lot. I just received word from a colleague in another branch of DESA that Haiyan passed away over the weekend. I am very saddened by this news as she was such a wonderful person that gave so much to the world through her work. Please convey my regards and deepest condolences to her family and the staff at DPADM. I know this must be a difficult time, but just remembering the positives and good she has done will help everyone through the loss. Please be ensured of our continued support and contribution to the network. Brazilian poet Francisco Otaviano said that “people who went through life in white cloud, placidly, just went through life, and did not actually live”. Haiyan transformed her life into a model of perseverance, professionalism, passion and pride for all those who worked with her. Haiyan actually lived and lives in all of us. Nous exprimons nos condoléances et compassion à vous tous. We are so sorry to hear about Haiyan’s passing away. May she rest in peace. She will definitely be missed as a great person. Please forward our sincerest condolences to her family. Je viens de partager cette mauvaise nouvelle avec le Ministre Massina.Nous nous souvenons qu’elle avait été admirable dans son accueil et son invitation à partager la fameuse collation qui avait permis de prendre cette photo. Nous vous présentons nos sincères condoléances que vous voudrez bien transmettre à tous les collègues à New-York. Bien à vous tous et du courage. This is tragic news. It somehow seems even worse, as if that were possible, because I had thought she was better. It is very sad for us as CEPA members because she has cared so much to strengthen our collaboration with DPADM. My heartfelt condolences to all of you in the Division. On behalf of the International Organization of Supreme Audit Institutions (INTOSAI) the deepest condolences to Haiyans family and UN colleagues. With Haiyan we lose a strong and committed partner in our common endeavour to strengthen worldwide transparency, accountability and good governance. Our prayers are with her, her family and friends. Deeply shocked by the news. Rest in peace. I am really and truly sad to hear about Haiyan’s passing. I am deeply saddened to learn of Haiyan’s passing. She was a wonderful international civil servant and a creative and courageous human being. I loved the sparkle in her voice and eyes and her passion for serving the world’s people. I will miss her terribly. My heart goes out to her loving family and her dear colleagues in DPADM and around the world. I had a great deal of respect for Haiyan. Her guidance to me three years ago when ITU first opened its liaison office in New York, and subsequently on issues of mutual concern, was always invaluable. 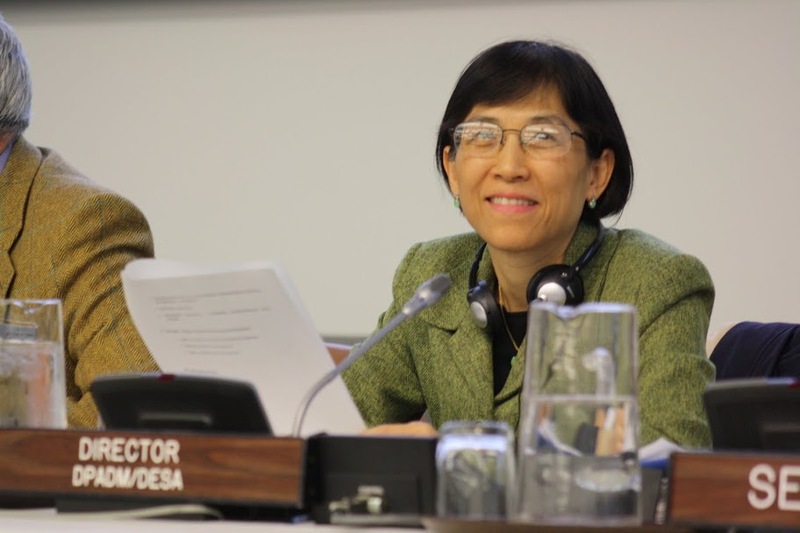 Her gentle good humour and dedication will be sorely missed by all of us in the UN family. Ms. Haiyan QIAN, a Friend for each and everyone. She brought happiness and joy to many. Let’s keep it on from this great Lady. We always remember her for her dedication to UNDESA and her efforts in developing the eGovernment sector. Some of her pioneering work will go a long way in benefiting the future generations. On personal basis I have always cherished the memory of our meetings. With prayers for the departed soul.